Chez Dyna is a charming old maison de Maitre in the centre of Alaigne, which has been lovingly restored by present owners Lin & Geoff . It is an ideal relaxing location to base your exploration of the Cathar country. Chez Dyna is less than half an hour to both the magical city of Carcassonne, the only fortified town in Europe still inhabited, and the spiritual hilltop village of Rennes-le-Chateau near Bugerach mountain - site of many Holy Grail excavations. 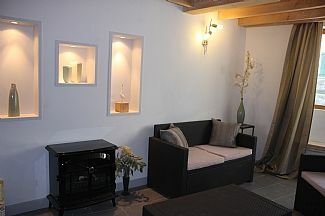 Chez Dyna now offers two newly refurbished very pretty adjoining gites (cottages) for holiday rental. We aim to offer guests a friendly, stress free stay with the possiblilty to blend self catering gite accommodation with b&b if required. We can be flexible about the duration of stay as well as the day of arrival and departure. We are located in a small but lively village with bakery, art gallerie/gift shop and post office. A freindly café-bar is located 3km. away as is a very nice swimming pool open in the high season. Top quality cycles of all levels - including electrically assisted are available for rental in our village. Newly restored modern living room with stereo, DVD libray, Wi-fi internet One sofa and one sofa bed and faux wood burning style electric fire. Please see photos. Please note : the TV is for DVD's only. There is no satelite TV. there is a child's play area in our village. we have two bicycles which you may use. Also in our village is a high quality cycle rental facility with all kinds of new cycles - including battery assisted. Notes on accommodation: Please ask for details of our (less expensive) one bedroom cottage. Outside: There is a cozy private courtyard with barbeque Cleaning / Towels / Linen / Maid service: All towels, and other linen are provided and changed weekly. A hairdryer is provided. No additional charge for end of stay cleaning. However, we do expect you to leave the gite in the same clean condition you found it - and to pay for any breakages. The property was spacious, well designed, clean and fully equipped - like home away from home. It was perfect for our group of 3. The town is safe. The property is close to the bakery, which is very convenient for a yummy breakfast of croissants and baguettes. The hosts, Geoff and Lyn, were helpful and friendly - very delightful. They provided restaurant & activities recommendations and even helped us deal with the post lady to send packages overseas. We had a wonderful stay there and would highly recommend it to anyone visiting the area. Information / tutoring etc on wine and Cathar history can be arranged. 30 mins. drive to the lakeside beaches at Carcassonne and Puivert.